So we took a bit of an unexpected hiatus in our plan to publish a weekly installment. Short story, I had to make some money and that means running around Los Angeles with a microphone and recording device of some sort, asking lots of questions and wishing I were taking the bus instead of driving my car on the freeway. I make money, you get a free tutorial. We are all happy. In our last installment we went over necessary equipment. One of the pieces I mentioned was a component that would allow you to attach an XLR cabled microphone to your iPhone. It has since been tested and the TASCAM iXZ is actually a very poor choice, and disappointing considering the price. Instead, I would suggest checking out this video on how to get the best sound through your iPhone using an external microphone. Note: I have not tested this setup but it is worth a shot if you want to go this route. I had to get through 4 big LAPD officers to get into the Mayor's press conference where he announced the eviction of Occupy LA from City Hall. The only Mayor's press conference where they said my InsightOut News press pass was not "good enough." The simple answer is the first amendment protects your right as a member of the press, to be a member of the press. You don’t need a press pass. Congress shall make no law respecting the free exercise thereof; or abridging the freedom of speech, or of the press; or the right of the people peaceably to assemble, and to petition the Government for a redress of grievances. It is very likely that your state will have similar code written somewhere. Now, all that being said, it is still pretty helpful to have a press pass. While all these laws exist, other “rules” have been created to still restrict the movement of, and freedom of, the press. Police departments tend to require that you have a press credential from their agency and they work fairly hard to make it somewhat difficult for anyone who is not part of a large corporate media entity to get one. Before we get further into applying for a police credential, I want to get back to your right to be a member of the press. I cannot stress this enough: you have a right to be press, that is protected. Technically, there should not be an institution or agency that decides whether you are press or not and therefore you, or the head of your news agency, can create your own press credential. 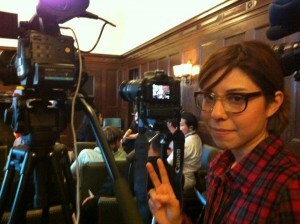 When I began covering Occupy LA I did not have a press credential. Eventually, though, I saw the advantages of having one. Police look at you a little differently, sometimes it is good and sometimes it is bad. Generally, you are left alone. The problem is that people have been conditioned to believe that a laminated little piece of paper hanging around your neck means something. For you, if that means they let you stand on the grass with the rest of the members of the press and they don’t kick you out, then so be it. After all, you want access right? So create your own press pass. I initially modified a version I found from an Indymedia sub-agency. I put my information on it, logo, and signed it. I took it to Kinkos (I think it is called Fedex Office now), had them print it out and laminate it for me. I then put it on a lanyard (which is also sold at the store) and put it around my neck. 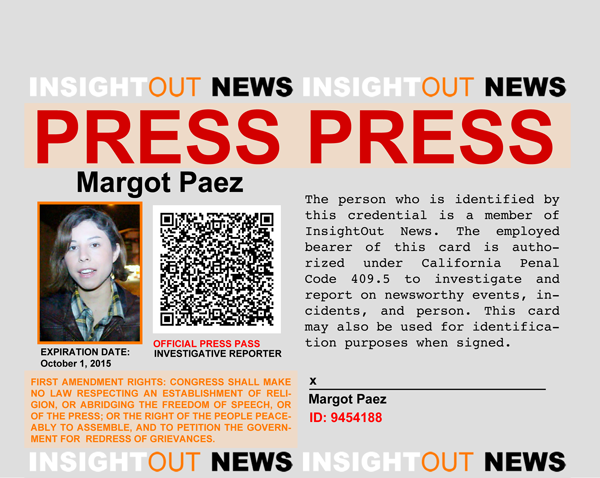 My current InsightOut News press pass. Since then, I have modified the pass to fit the new design of the website, and to make it look more professional. A lot of people have taken the Indymedia press pass template and made it their own, so it is a little weird to wander around with the same badge as other people. Someone once told me I was walking around using a shady press pass because some “shady person” had a similar one. Alright, whatever. I changed it. Why a logo, a pass issue number, etc? You are entering a professional field and people have certain expectations and an image of what a journalist or member of the media/press is. If you want to be taken seriously, you need to be a professional and your badge needs to reflect that. 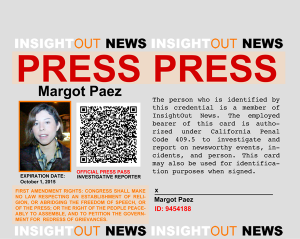 I put both a reference to the California penal code and the first amendment on the back of my press pass. My KPFK press pass only references the California penal code, however. I have read them to the police before, in hopes that it will keep me from being arrested, so far I have managed to escape being detained because I was wearing my press pass. Although it has not saved me from being grabbed at or threatened with arrest. Quick story: I was covering a march that began around 8pm sometimes in late October or early November. The march was supposed to be in solidarity with Scott Olsen, the Iraq war veteran who joined Occupy Oakland and was hit by a tear gas canister, suffering a serious concussion. The march was being followed by police in unmarked vehicles and I would occasionally stop to film the officers inside to document their presence. The group of about 100 protesters decided to march to Skid Row and as we crossed through a cross walk, a police car turned the corner with its lights on, the driver saw me with my camera, told me to stop and that I was being detained. The reasons were not clear but from what I could tell, the stop in the cross walk was red. I was following the group and was focused on filming, so I was unaware of the do not walk signal. Anyway, as I peacefully followed orders I announced that I was press quite a few times and flashed my badge. The other officer must have taken note because he advised the first officer, who was ready to arrest me (or cite me), to let me go. Lesson learned. Always wear my press pass. Moral of the story: I was not wearing an issued credential from ANY organization other than InsightOut News. So do not worry if you initially do not have the county or city police department’s credentials right away. You will most likely be fine. Moreover, I have managed to argue my way into certain events because I took some steps ahead of time, or because I demanded that I had rights and I should be allowed in as a member of the press. 90% of the time it is golden to just have your own organization’s press credential. If you act like you belong there, you probably do. If you want the fancy one that all the big news agency reporters wear around their necks, then you have to apply with the press relations department of your local police or sheriffs department. They will most likely require that you have a business license and show proof that you are covering stories that involve crossing a police line. Mine was denied initially, with a note saying, “business license?” I asked to speak with the head of the department and never had my calls returned. It has been a slow process, but I finally got my business license and will be re-filing for the credential (granted I can get one through KPFK but I have pride issues). By the way, another argument the person I spoke with over the phone had was that Occupy LA was OVER, so I had to show better proof that I needed it. I laughed at her. Moral of this story? Try and try, until you succeed. Or keep nagging until they say ok…or arrest you. Thanks for following along. See you next time!